"Yes, then, it is I, the Great Mother, Creator of all, the One, the I Am, the All That Is, no matter what name you have for me, it is I, the One who has created you and given you Life. As you are in the last message now for your Season of Peace celebration, I have some special words that I wish to share with you. 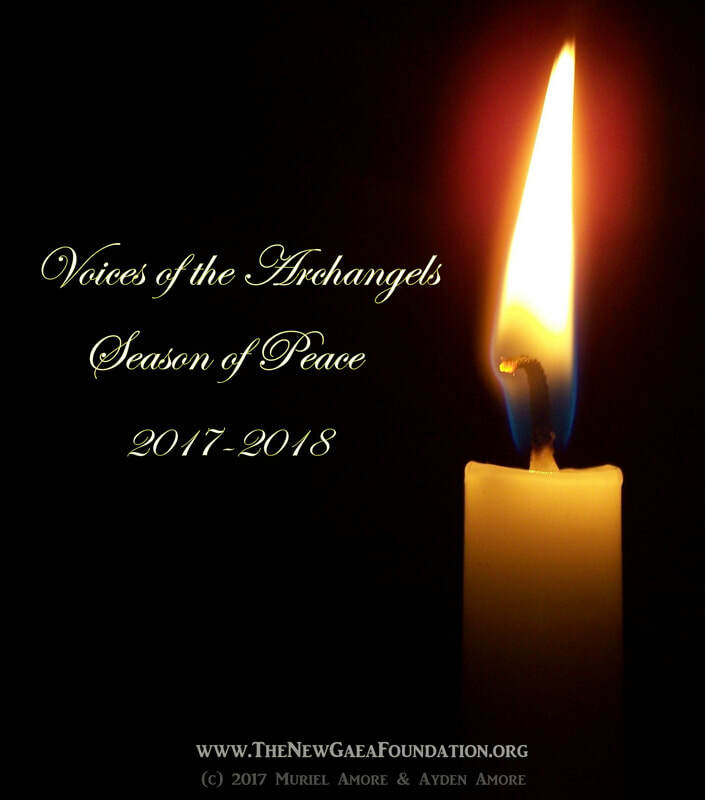 Over the years, you have heard many messages from the Council of Archangels and from myself. You have heard their passion and their pleas and their stern words. In many other ways you could describe the words they have shared with you. Some of you have listened. Some of you have listened and paid attention for a moment and let it go by, in one ear and out the other, so to speak. Out of sight, out of mind, as the saying goes. underneath all those shadows, and filters, and inhibitions, and fears. the star that you are, so to speak, the Light that you are. And I say that you can no longer hide in the playpen of Life and pretend that you are little children who do not know any better. and do the real thing when it comes to living Life. because now you have the opportunity to live. Are you truly ready to live? Are you brave enough to face yourself and face your inner fears, and your Truths, and your own Light? Are you brave enough to turn your Light around and show it to the entire world? Or will you keep it covered and buried deep within? I say to you that it is no longer appropriate to hide on a mountainside in a cave and meditate. It is no longer appropriate to hide behind the skirts of others, so to speak. When you come together, you come together to shine more brightly, not to hide behind each other's Light. there are things coming that are going to call upon you and challenge you to stand up to the Darkness in the world. And I say that if you do not stand up and shine your Light as brilliantly as possible, that Darkness may well wash over you, like so many waves crashing against the shores on a beach line. to be who you truly are. your own Empowerment, and your Strength, and so on. This is who you truly are. And it is time for you to stand strong and stand tall, and be who you are meant to be. And as you do, and as you stand with others who are standing in the same way in their Truth, and their Strength, and so on, then you become a formidable force against the darkness. The darkness will not leave without a fight, so to speak, and while we have schooled you to know that fighting is not Peaceful, we also school you that Strength is necessary. and you must allow it to shine. And as you do, the Darkness will recede until it is no more. It will go away, and all those who choose to live in Darkness will live together in their own civilization. And those who choose to live in Light and Love and Peacefulness will live in their own civilization. The dimensional spaces will part, and it will be a situation of to each his own. There will be no going back and forth. In this case you cannot ride the fence, as the saying goes, any longer. You cannot have one foot in both worlds. It is one or the other. And the time is drawing near for this split to happen. You must let your actions follow your choices. You cannot pay lip service to this choice, my children. That is to say that you cannot speak one thing and do another. You must follow your inner guidance. It is time for you to grow up and be who you are. You have played at Life long enough. Now it is time for you to live. There are other things coming, there are new chapters in the Gaea book, so to speak, the book of Life, her Life, and your Life with her, all of you who reside there with her. There are new days coming, and those new days will require new ways of living. And you must live in Illumination. You cannot play with the toys of Illusion any more. The play things of Illusion must go away now. And they will be left to those who wish to remain in the playpen. But for those of you who are ready to live, I say come out. It is time for you to come out. We have given you the steps necessary. It is up to you to do this now. It is up to you to place one foot in front of the other and walk the path before you. There is help for you every step of the way. I am always here, as are the rest of the Guides. You are never alone. The Leagues of Light are here to Support all who would choose to live in Light. And those who choose to live in Darkness will have their own Supports. and not a faction of Illusion. And so I say to you, wake up, and be who you are. Wake up, and let your Light shine. Wake up, and Love your brothers and sisters. Wake up, and remember who you are. It is time and you are needed, every one of you. a new cycle of Rebirth. and a Joyous and Peaceful new Life that is filled with Love and great Abundance. But it will only be yours if you have the Strength to stand in your own Truth. Hear my words, and remember them well. And remember that you are Loved beyond measure. Remember that I gave you the state of Grace. I gave you Freedom. Use it. for it is the strongest weapon I could ever Empower you with. With these words then, I shall leave you to begin your journey of Rebirth. And I leave you with my Love, as always. I will see you soon, Beloved Ones.